UPDATE: He’s here! Welcome to the world, Sam Sullivan. Sam was their favorite from the beginning, and a reader suggested Sullivan – which happens to have special meaning for the family. Thanks to all! My husband and I are expecting a second baby boy around Thanksgiving and we haven’t decided on a name yet. We’d love some ideas and suggestions from you and your readers. Our son is Jake Ryan. As you can see by Jake’s name, we are not concerned about the popularity of a name. I’ve always thought I would prefer to give my child a full name and then call him by a nickname, but when it came to naming our son Jake, my husband didn’t like Jacob but loved Jake so I went with it. With this baby we’d be open to either a nickname as the full name or a formal name with or without a nickname. My husband’s first pick was Sam but he’s open to other names. We’ve got a few options that are all good, but we can’t decide! The good news is we’ve got similar taste. Jake Ryan is handsome, traditional, and kind of cozy – a flannel shirt kind of name, not a three-piece suit. Lots of the options on your list seem like good matches, with a classic-but-casual vibe. I would drop Drew. It’s perfect, but it sounds like it’s taken! James is a tough call. Yes, James and Jake share sounds. More than that, they’re actually two forms of the same name. (Sounds crazy, right? But check out the family tree!) But if you like the way Jake and James sound together, then there’s no reason to rule it out. In fact, plenty of families like that shared sound. Hudson, Clark, and Hunter all seem compatible with Jake, but a tiny bit different. They’re a little more like Ryan than Jake. That leaves Will, William, Josh, Evan, Matt, and Sam. I’m so tempted to mix and match these until we find the perfect combination. Sam Hunter, Josh Evan, Matt Hudson? I love the idea of Jake Ryan and Matt Hudson as brothers. But I’m putting the pattern above everything else. And that might not be right. 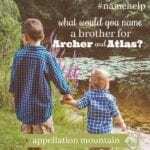 Because you mentioned that you don’t mind the idea of a formal name with a nickname. And nothing on this green and verdant earth says that sibling names must match like china table settings. If you want a name that fits the pattern, then I’d narrow your list to the three I’ve already mentioned: Sam Hunter, Josh Evan, Matt Hudson. Or maybe there’s a better match? Readers, please chime in! 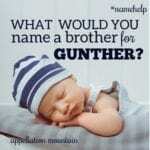 If you want a similar, but slightly different name, go with William “Will” Hudson, Evan Matthew, or maybe Hudson James. Does one of those approaches seem more appealing? Graham – I think Graham falls somewhere in between Hunter and Jake. It’s a gentle sound, homespun and handsome. And it’s impossible to peg Graham to a single decade. 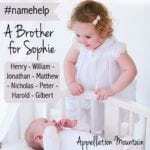 Jesse – A Biblical boy name with a great meaning – gift – Jesse feels traditional and approachable, too. Heath – Outdoorsy Heath could be big right now. But somehow, even as we embrace River and Rowan, we’ve overlooked this one. Max – I feel like you must’ve considered Max. It’s a mini name, but one that doesn’t feel like it requires a longer version. Sawyer – If Hunter is on your list, maybe Sawyer has come up, too? The Mark Twain characters lends it an Americana vibe. Zeke – Plenty of boys are Ezekiel, called Zeke. But I think just Zeke works well, too. The repeating ‘k’ sound of Jake and Zeke is either too close … or just plain fun to say. I’m tempted to suggest names like Toby and Davey, because I think they hit the same note. But they don’t sound quite like the choices you’re currently considering, so I’ll put them aside. Overall, my favorite from your list remains Matt, especially with the middle name Hudson. But I wonder if you’d like a name like Heath, Jesse, or Graham? They seem like they fall midway between the Sam/Jake names and some of your other choices. Readers, I know you’ll have some great thoughts on this one! 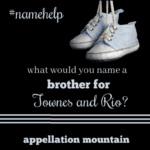 What would you name a brother for Jake Ryan? Thanks everyone. These are great suggestions. My husband likes a lot of them too! I like Clark off your list! Of your choices, I love Sam and Clark. Heath and Graham are great suggestions too. I also love the suggestion of Red, maybe even Rhett could work. 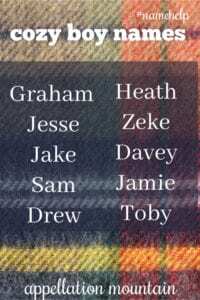 Jake, Sam, Josh, Matt and Drew are all nicknames based on Biblical names, and James is a Biblical name, so there are good options if you want something similar: Adam, Benjamin/Ben, Zach, Nathan, Michael, Thomas. I like Zach Hunter. There are some great options here already!! Cole would be great, or if you’re feeling a tad more adventurous Colby? From Abby’s list my fave is Heath :). Love Graham, Heath or Sam for you. How about Logan? He comes with a Hugh Jackman grin and seems casually cool. Or what about Hugh? Both have a friendly masculinity and are one syllable each. Joss is really close to Josh, but Joss feels more 2018. Joss brings to mind famous director Whedon and dusty ranches from the wild west. Laid-back nickname of Red, he is affable and earnest. Best wishes and congrats on your son!! Of your choices, I really love Clark Hudson with Jake Ryan! Clark makes Jake read a little more vintage and Hudson gives Clark a touch of adventure somehow. I have a soft spot for Graham and Heath from Abby’s list.